1. Preheat oven to 400F. 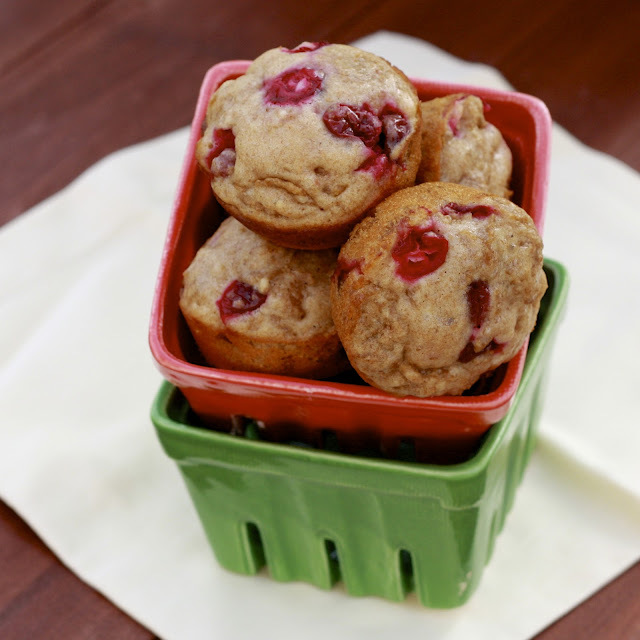 Spray a muffin tin with baking spray or line with paper cups. 2. In a large bowl, combine flours, sugar, baking powder, salt, cinnamon, and nutmeg. In a separate bowl, combine the water with the dry milk. Add oil and egg, stirring to combine. Add the wet ingredients to the dry ingredients, stirring to combine. 3. Stir in bran flakes and cranberries. Spoon batter into prepared muffin cups, filling 2/3 full. 4. Bake for 12-15 minutes, until an inserted toothpick comes out clean. Remove from rack and cool slightly before serving.